Not all MPPT is the same: Sparq's unique architecture provides superior MPP tracking that translates into better power harvest. The main goal of Maximum Power Point Tracking (MPPT) is to take (“harvest”) the maximum possible energy generated by the continuously-variable voltage and current outputs from a solar panel. This energy then must be converted into stable, synchronized AC current and voltage waveforms that the utility’s grid can accept. MPPT that use ‘trial and error’ or ‘seek and find’ approaches, may lead to oscillation around the optimum power extraction point from PV, which adversely impact the overall system efficiency. MPPT approaches that use large passive components such as electrolytic capacitors are inherently slow in adapting to ever-changing maximum power tracking point from the PV module: this is because large capacitors take comparatively more time to charge and discharge, which introduces delay in following a continuously variable power point. In short, such MPPT approaches only achieve maximum energy harvest at times when PV modules can deliver stable power for a period of time that can be comparatively long, from a PV module’s perspective. Moreover, MPPT is ineffective when the converter operates in “burst mode”. This happens when the PV module is producing at a low percentage of its maximum possible power, which happens typically in the early morning, the late afternoon, and whenever cloud cover or heavy shading affect the PV module. Sparq’s Quad microinverter connects to four separate PV modules and provides independent MPP tracking functionality to each module. As with other module-level power electronic (MLPE) solutions, this per-module MPP tracking approach accommodates the individual performance differences between panels that are the norm for most PV module arrays. The Quad’s ability to very closely track a PV module’s maximum power point is due to its high-frequency digitally controlled resonant power architecture, which allows frequent sampling of a PV module’s output power. Rapid sampling reduces the difference in measured power between temporally-adjacent samples. This lets the DC/DC converter’s input voltage set point be quickly adjusted to track the PV module voltage needed for peak power production. Below is a drawing of the high-level architecture of Sparq’s microinverter platform. The platform utilizes a two-stage power conversion approach, with the first stage concentrating on PV module energy harvest and buffering the rest of the power conversion process from a continuously-variable DC voltage and current supply. The remainder of this Technical Note will focus our attention on the first of the two conversion stages, and in particular the patented MPPT technique that Sparq’s microinverter platform uses to maximize PV module energy harvest. Note that the Quad’s MPP tracking approach uses primarily input power measurements as opposed to relying primarily upon input voltage from the PV module. Relying upon instantaneous power measurements helps the Quad to track a PV module’s MPP across a comparatively wider range of module output voltages. Rapid input Voltage Set Point and high frequency switching operation of the converter provide nearly ripple free voltage at the PV panel. 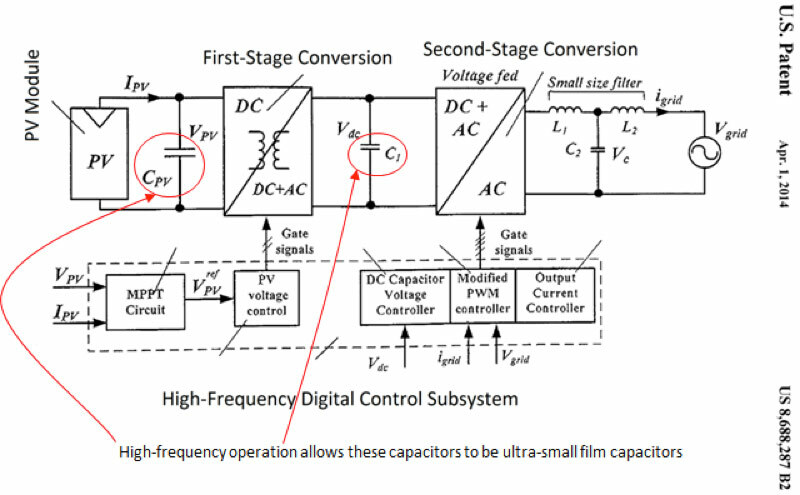 A high system clocking rate permits the use of ultra-small capacitors, which can quickly charge and discharge to respond to comparatively smaller fluctuations of input voltage than what might be seen with traditional approaches. The innovative MPPT approaches of Sparq help in achieving a ‘Steady-State MPPT’ efficiency of 99.9% and ‘Dynamic MPPT’ efficiency of 99.8%. The Quad’s high-frequency digital control design (shown in more detail in the figure above) includes closed-loop feedback and Proportional-Integral (“PI”) Controllers, which combine to provide very close tracking of changing PV module power output as well as a high level of stability in the Quad’s power conversion circuitry across a very wide range of voltage and current inputs. Additionally, the Quad performs sweeps of each connected PV module’s output voltages and corresponding currents to establish its individual maximum potential power production point. This point is used as a reference to avoid potential sub-optimization at a lower power point. These same high-frequency controls, coupled with sophisticated resonant power conversion, place smooth, synchronized sinusoidal current and voltage waveforms on the grid, free of the pulsing currents that can result from some more traditional approaches using ‘Burst Mode Operation’. The rapid adjustability to changing input power ensures that more of the power generated by the PV modules is captured and placed onto the grid in a highly-stable and highly-consistent manner. Because the MPP tracking methodology is integrated into four-ports of Quad microinverter directly connected to each PV module, the Sparq’s approach does not suffer from DC wire losses incurred by DC power optimizers that must be connected in series and typically need long wire runs back to a centrally-located inverter. Though most inverters today claim high MPPT performance, often the measurements are conducted over a favorably narrow range of the actual power production levels seen at almost all PV modules over the course of each day. Sparq’s Quad uses advanced high-frequency input power sampling methods and a digital control plane to closely track each connected PV module’s dynamically-moving maximum power point over a comparatively very wide range of voltages and currents, combining and converting four maximized DC power streams into a single, stable, and synchronized AC output. “Distributed Power Generation Interface”, US Patent Number 8,688,287, September 17, 2010. 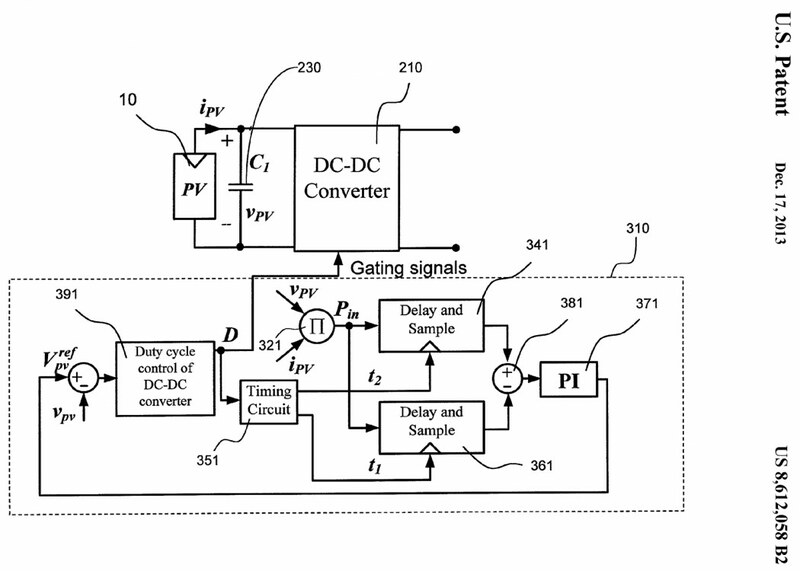 “Maximum Power Point Tracking for a Power Generator”, US Patent Number 8,612,058, April 26, 2011.